Rieder, M.; et al. (1998). “Nomenclature of the micas” (PDF). 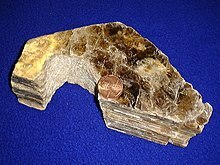 The Canadian Mineralogist (Mineralogical Association of Canada) 36 (3): 905-912. ISSN 0008-4476. NAID 80010636747. http://www.mineralogicalassociation.ca/doc/abstracts/ima98/ima98.htm.